The act of signing your signature to a credit card receipt is becoming a thing of the past. Visa, American Express, Discover and Mastercard have all said that they will no longer require customers to sign their names to credit card receipts. Some cursive scrawled on a piece of paper doesn’t seem to matter much in today’s digital world. The importance of signing things has faded. Signatures started out as a way for record keepers to leave their mark. Then, people began to use the handwritten signature to prove their identity. Today, banks know that signatures are not an effective means of combatting fraud. The reason for the change is changing technology and consumer habits. MasterCard executive vice president Linda Kirkpatrick called the elimination of the signature requirement “another step in the digital evolution of payment and payment security.” Britain and the rest of Europe have already gotten rid of signatures for credit card receipts. Years ago, banks in Europe began issuing credit cards that contained microchips to replace signing. Increasing convenience is also a large part of the rational for the change. Kirkpatrick said that getting rid of signatures will “speed customers through checkout, provide more consistent experiences for every customer with every purchase and should decrease costs associated with safely storing signatures.” According to MasterCard, more than 4 out of 5 transactions in North America didn’t require a signature at checkout. Most consumers swipe their own cards at point-of-sale terminals, meaning few store clerks physically handle the cards themselves. Even then, most stores don’t check the signature on the back of a card against what the customer signs in front of them. Several of the largest retailers, including Walmart and Target, have moved to drop the signature requirement. Home Depot had already waived the requirement for purchases under $50. American Express has not required a signature for transactions under $50 in the U.S. since 2012. 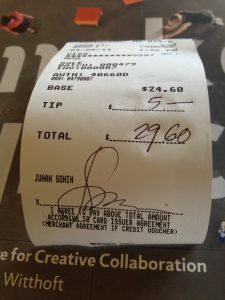 The change doesn’t mean that you won’t be asked to sign receipts ever again. Many merchants may leave the signature requirement in place. Numerous businesses, particularly restaurants and rental car companies, still require a signature.